Captain Thomas graduated from Washington State University in 1984 with a Bachelor of Arts degree in Criminal Justice and Political Science. He received his commission through Aviation Officer Candidate School in Pensacola, Florida in December of 1984. Subsequently, he reported for flight training and was designated a Naval Aviator in May 1986. Following his initial Fleet Replacement Pilot Training at Helicopter Combat Support Squadron Three (HC-3) flying the H-46, Captain Thomas reported to the Gunbearers of HC-11 in San Diego, California. During this tour he made Western Pacific and Indian Ocean deployments aboard the USS Wabash (AOR-5) and the USS Wichita (AOR-1). In July 1990, he reported to HC-3 as a fleet replacement instructor pilot. During this tour he held a variety of assignments including Assistant Operations Officer and Administrative Officer. In July 1992, Captain Thomas reported to the USS Coronado (AGF-11), the Commander Third Fleet Flagship, as the Air Boss and Safety Officer. After earning Officer of the Deck Underway qualifications, he reported to Commander Helicopter Tactical Wing Pacific as the H-46 class desk and Operations Officer. In October 1996, he reported to the Providers of HC-5 located at Anderson AFB, Guam. During his department head tour, he served as Officer in Charge of Detachment 6 aboard USS Belleau Wood (LHA-3) and as Administrative Officer. In November 1998 Captain Thomas reported to United States Strategic Command in Omaha, Nebraska where he served as Branch Chief for Pacific Command in the J55 Division. Captain Thomas reported as Executive Officer in May 2002 and subsequently, Commanding Officer of HC-11, the Navy’s largest operational helicopter squadron with over 400 assigned personnel. In June of 2004, Captain Thomas reported to the United States Army War College in Carlisle, Pennsylvania as a student, earning a Masters Degree in Strategic Studies July 2005. In July 2005, Captain Thomas reported to United States Northern Command in Colorado Springs, Colorado serving as Crew Commander in the NORTHCOM Command Center and as Vice-Director for the Office of the Secretary of Defense Joint Test and Evaluation, Joint Integrated Command and Control for Maritime Homeland Defense (JICM) project. 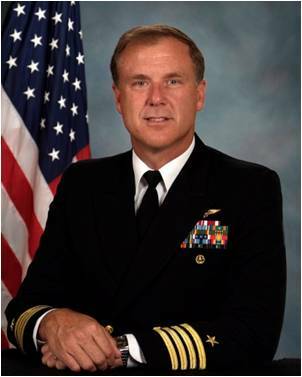 Captain Thomas’ awards include the Legion of Merit, Defense Meritorious Service Medal (two awards), Meritorious Service Medal, Navy and Marine Corps Commendation Medal (three awards), the Joint Service Achievement Medal, the Navy and Marine Corps Achievement Medal (two awards) , as well as various campaign and service awards. Captain Thomas is married to the former Lenae Schmeling of Guymon, Oklahoma. They have four children, Madison, Logan, Dawson, and Brooklyn. Captain Thomas retired on 01 September 2009 after serving 25 years of active duty to his country.